Lower Manhattan is now home to the latest Moxy property, the Moxy NYC Downtown. 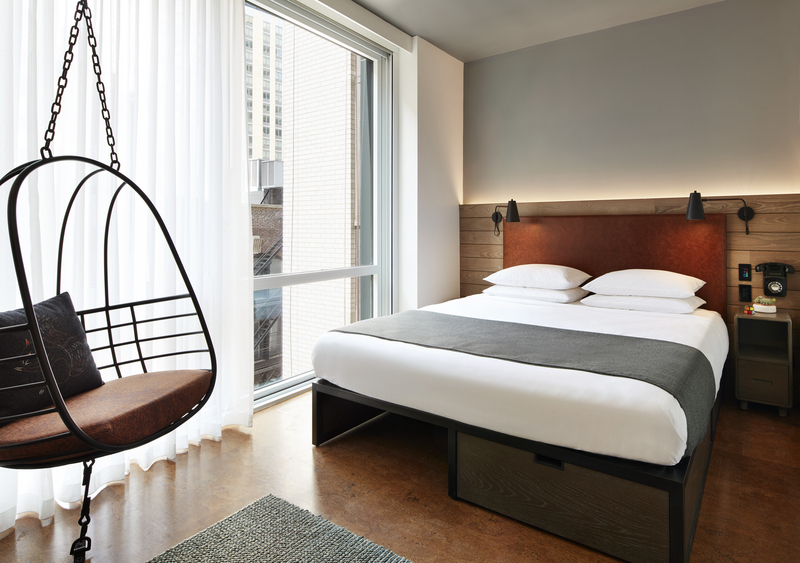 Designed by Stonehill Taylor, the new 30-story hotel brings a playful, relaxed vibe to the neighborhood with innovative technology, inspired guestrooms, and the retro-inspired bar and lounge Recreation from Jon Neidich. The property welcomes visitors with a dramatic 22-foot atrium lobby featuring a 13 by 21-foot state-of-the-art LED wall, which showcases custom digital art installations and serves as a virtual window into Recreation upstairs. By day, the bar is a communal hangout with all of the conveniences to work remotely. When not on the clock, guests play classic arcade games or get competitive with skee-ball, Jenga, or the basketball court, which doubles as a unique private event space equipped with seating for up to 40 people. At night, Recreation transitions into a relaxed local haunt enlivened by cocktails and music. The 298 guestrooms, meanwhile, feature 10-foot floor-to-ceiling windows, with views overlooking the Brooklyn and Manhattan bridges. Custom-designed leather beds offer storage, and the walls are composed of reclaimed wood paneling that blends seamlessly into cork floors. The bathrooms feature oversized showers, Lefroy Brooks black matte bathroom fixtures, and custom tiles cheekily warning, “Slippery When Wet.” Other playful touches include custom murals painted by Brooklyn based artist Ben Cowan and neon room numbers in gold, magenta, and blue.